Is there rhyme or reason to America's foreign policy? America is stunning its Eastern European allies, the Czech Republic and Poland bay scrapping a missile defense system in Eastern Europe. CNN reports as follows. "The Obama administration will scrap the controversial missile defense shield program in Eastern Europe, a senior administration official confirmed to CNN Thursday. But he did explain the logic of doing so, saying Iran -- a key concern for the United States -- was not a threat." Iran is not a threat? The Iranians have been a matter of serious concern, exerting a powerful force in the former Soviet Republics that border Iran. They have subsidised unrest in Lebanon and threatened to wipe Israel off the map. Now they are developing nuclear weapons as well as missiles that can strike Europe.If the disturbing history of the Islamic republic of Iran does not merit the maintenance of strong defenses, then what does? There is the additional problem of Russia's post communist posture in Eastern Europe and beyond. There are many people in Russia who wax nostalgic for the days when the former USSR was an empire surrounded by dutiful satellites. Whatever the posture might be of current Russian leaders, things could change in the future. Taking defensive weapons systems out of Eastern Europe at a time of flux and instability seems extremely ill advised. President Obama is very much in favour of conciliatory overtures to America's enemies. There may be a place for this. President Bush also made it clear that it was only a militant minority within the Islamic world with which he had any quarrel. But What is the logic of simultaneously snubbing our long time friends? The Obama administration is acting like a kid with a tool kit who is eagerly using all his tools with no coherent objective in mind, taking apart everything he can get his hands on with no clear objective in mind. Is the Obama administration realligning the US with former enemies. Or is the Obama administration reaching out in an awkward way? Is Jimmy Carter pulling strings behind the scenes? None of the scenarios that come to mind in attempting to fathom America's alleged foreign policy are very comforting. It is a chilling coincidence that today is the 70th anniversary of the Soviet invasion of Poland. 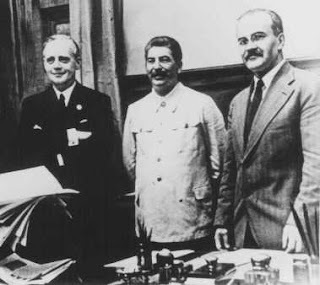 In 1939, after "friendship" had been declared, the Soviet Union took its portion of Poland. The theme of betrayal by superpowers is a powerful theme in Czech and Polish history. From the agreement brokered by Neville Chamberlain in 1938 which sold Czechoslovakia to the Nazis to the Soviet German friendship treaty in which Poland was divided between Nazi Germany and the USSR, the theme of betrayal still resonates in the hearts of the peoples whose sovereignty was bartered for an illusory peace. Perhaps this was on the mind of Polish Prime Minister Donald Tusk would not take a phone call from Secretary of State Hillary Clinton. The Politico web site reports as follows. "Polish Prime Minister Donald Tusk confirmed today that he declined last night to take a call from the U.S. informing him of the decision to scrap planned missile-defense bases in his country. Two U.S.-based sources close to the Polish government said Thursday that Tusk also rejected a call from Secretary of State Hillary Clinton — on the grounds that, as the head of the government, he should speak to the president. "Hillary called — and the reason he turned it down was because of protocol," said a source. Questions about the exchanges surfaced in the Polish press after Obama reached the Czech prime minister late last night to warn of the policy change, but did not speak to the Pole until this morning. And the static offers a glimpse at the distress beneath the diplomatic facade being offered by Eastern European leaders." America's ship of state is in troubled waters. And its captain seems to be under the influence. Of what? Of whom? Does President Obama really believe that he and his trusty teleprompter have enough magnetism and charisma to win over our enemies? The dividends of Obama's peace overtures have yet to materialise. I hope that Obama's experiments in foreign policy do not cause any lasting damage. He has certainly undone the legacy of the Bush administration. But with what will he replace it? I do guess they want us bury alive? Or, what??? We need all the protection we can get due to the hate they have for us and our "Freedom"!!! Help!! !